Oakdale Family Dentists, Drs. 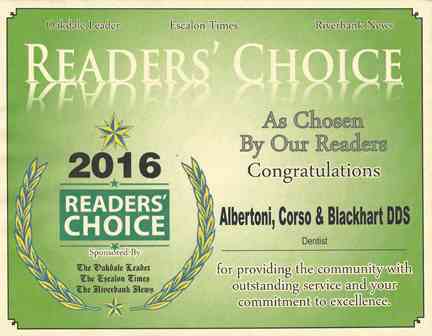 Albertoni, Corso, and Blackhart. A General Dentistry practice focused on prevention and high quality treatment that is honest, caring, and affordable. We are a comprehensive general dental team dedicated to providing top quality care for any person we have the privilege of treating. We believe that every patient is important and unique. It is our goal to work with you to meet your needs in preventive care, dental education, aesthetic restorative solutions, as well as elective cosmetic improvements. Please call to schedule an appointment. We can't wait to meet you! We are conveniently located on the highway as you drive toward Riverbank and Modesto. Just look for our sign and stop in to say hi. We love to meet new people, so new patients are always welcome! We will make every effort to schedule you an appointment as soon as possible. If you need urgent care please call right away and we will make time to see you. We know that seeing a dentist is a very personal experience, and we want you to feel as comfortable as possible. Please ask questions and be sure to let us know if you want further explanation for your recommended treatment. Our staff is well qualified to answer your questions, and we all want to do our best to give you a pleasant experience. Check out some of our favorite pages on the website. We feel strongly about preventive care, so you should definitely read our article on Oral Hygiene Instructions. It's everything we want to tell people, but never have enough time for in our short visits! A guide to better oral hygiene home care. Tips on how to brush, floss, eat, and other tips for preventing dental diseases. Digital X-rays can be an important diagnostic tool for dentists. This information will help you understand the risks and benefits in order to discuss with your doctor. 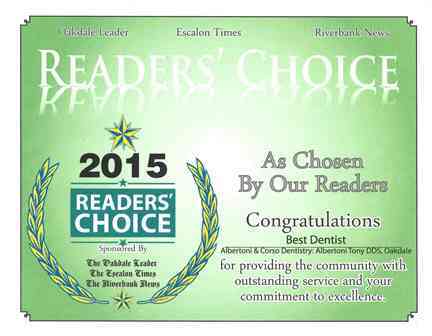 We are so honored to have been voted Best Dentists 5 years in a row in the Oakdale Leader Readers' Choice Awards! 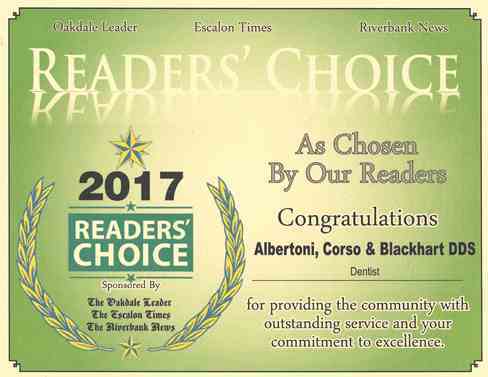 Thanks to all our wonderful patients who voted!